We are flying in the very best mental baseball coach in the world. 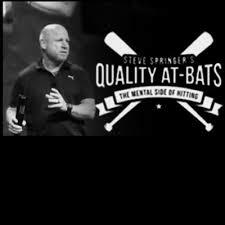 Steve is a former MLB Player and Coach and works with dozens of MLB Players on the mental game of baseball and specifically hitting. He teaches confidence, aggressiveness and the ability to relax. This will be the very best $20 you ever spent on player development. We spend $75 - $100 per hour on private instruction. This $20 will transform your approach to the game. Steve's message covers players, parents and coaches so all are encouraged to attend. You can find additional info on Steve Springer and Quality At Bats at the button below.